I hate it when I order a tofu sandwich somewhere, and it pretty much just tastes like (or actually is) blocks of watery, plain tofu stuffed between two pieces of bread. What’s up with that? You might as well be eating a wet, mushy sponge. I love me some tofu, but you got to treat it right, you know? 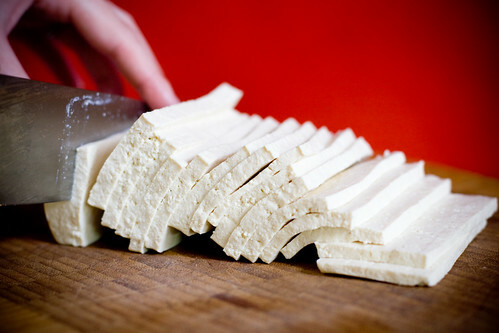 So I was thinking about tofu, and imagining thin slices of flavorful goodness to stuff into sandwiches. I knew wanted to use miso as the base for the flavor. The first sauce I mixed together used a bit of maple syrup, which seemed like a good idea until I tasted it. Something about the combination of red miso and maple syrup did not sit well with me, so down the drain it went. I moved on to pure, unadulterated sugar, a twist of lemon, a splash of tamari… I was definitely getting close. I scooped in a little bit of nooch (nutritional yeast, aka vegan pixi dust) and liquid smoke and it was finished. It’s a dead-simple marinade, tangy, salty, smokey and rich. I wanted eat it like a soup. I thought some pan-frying was in order, but when I heated up my cast-iron skillet and proceeded to burn all of the sauce right off the tofu, I decided the oven was a better choice. The oven baked the flavor into the tofu, and 20 minutes was all that was needed since the slices were so thin. This tofu will keep well, so it’s nice to make a whole block and set it aside for sandwiches, salads, or.. umm… snacking directly out of the fridge. 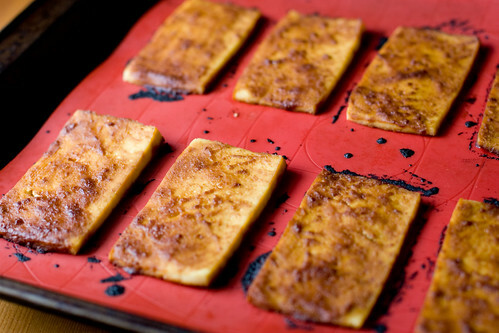 Preheat the oven to 425º F. Wrap your drained tofu in a few paper towels, then again in a terry cloth bar towel. Press with something heavy – a cast-iron skillet, a plate with some cans on top, etc, for 10-20 minutes. Meanwhile, mix the marinade together. Line up your slices on a baking sheet topped with a non-stick baking mat. 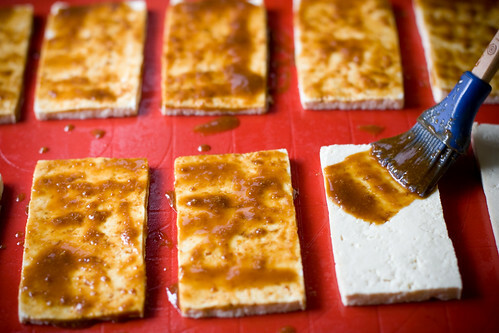 Brush both sides of the tofu with the marinade. Let the slices absorb the marinade for 10 minutes or so, then brush just the tops again. Bake for 20 minutes at 425º F. Remove from oven and let cool on the sheet. The tofu should be darkened around the edges, but not burnt. Use immediately or refrigerate for later use. I’m a simple girl, so some vegan mayo, baby spinach, and sourdough toast were all I needed to make a delicious sandwich. 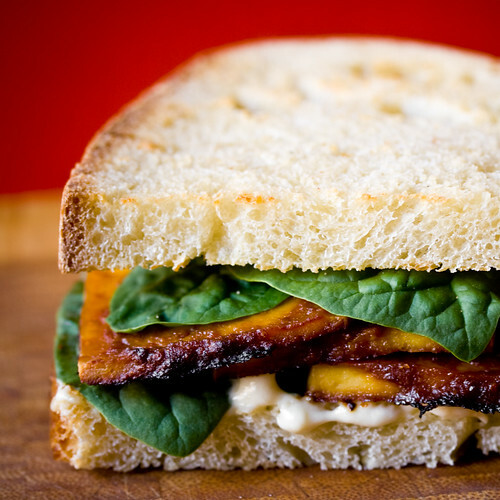 Whatever your favorite sandwich fixin’s are will go great, most likely. 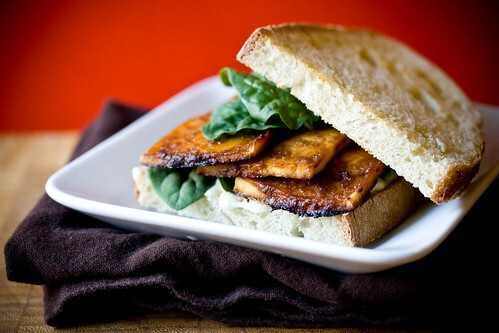 This would tofu would make a nice vegan BLT! 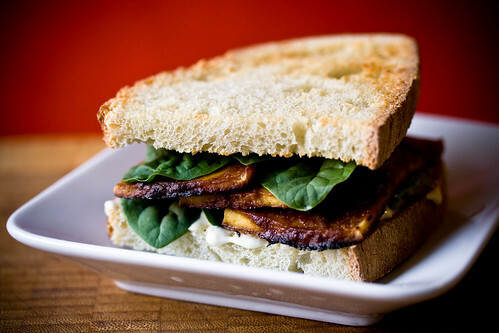 Now that’s a tofu sandwich! Wow.. That looks so easy… Yummy too! Wow that looks really good. I sit in a cleanroom all day and would love to have that for lunch! This looks delicious, I will check it out this week. I make something similar that is tofu marinated in lemon juice, garlic, honey, tamari, fresh oregano, and a splash of sesame oil. I grill it on a cast iron grill. This is inspired! I made tofu steaks (on my blog) last week & am trying marinade variations, as well as some crazy stuff with your basic technique, now. I was referred by Elle of Elle’s New England Kitchen, and she’s wild about this, too! Recently got your cookbook and made these…WOW!!! YUM!! I love this recipe and it will be a staple at my house. Thanks!! This was delicious! I bought some miso a couple weeks ago after reading about its incredible health benefits, and hadn’t even opened it until I saw this recipe. I made these over the weekend for a baby shower. They were so good and a huge hit. June 21, 2010 - 11:55 am Pingback: Sand’vich « Worst. Vegan. Ever. January 4, 2011 - 5:20 pm Pingback: January vegan challenge: Opening day! « Vegan Challenge!